A few of my favorite Allergy Friendly Products… – Allergy Foodie: Thrive with top 8 food allergies! Recently a super fun event occurred in my life – I had the opportunity to visit the world headquarters of Mondelez International, the American multinational confectionery, food and beverage company. So, big deal one might say but my excitement stems from the fact that ‘Enjoy Life’ is an independently owned subsidiary of Mondelez! I use the word ‘independently’ very consciously. Way back in 2015, when Enjoy Life was acquired by Mondelez, I was concerned, very concerned. Would a small Allergen-free snack food company survive in the big corporate world. On that front, am I relieved or what – Enjoy Life has become bigger and better but continues to have the small company feel. They continue to engage with customers like myself on a personal level via social media which has convinced me that they sincerely care that my child with severe multiple food allergies should be safe but not deprived. The highlight of the visit…an opportunity to drop in at the company store and get my hands on discounted Enjoy Life – yayy! But the best was yet to come…my greedy eyes fell on the the new snack packs. Small packets of soft baked minis by Enjoy Life. Now, my son and I love the fresh box of Snickerdoodle, Double Chocolate Brownie and Chocolate Chip Cookies by Enjoy Life but my one problem with the soft baked Enjoy Life cookies is that it becomes rock hard within days of opening the box. Granted that I can warm it up in the microwave to soften it but the new snack bags are just right for the school lunch box and I don’t have to worry about wastage after having spent an arm and a leg on them and driving miles to find a store that stocks them. These snack packs are a sure winner and a must try for anyone with the top 8 food allergies or even someone who wants to eat healthy and whole grain or gluten-free. Now these chocolates are not dairy-free but they are completely tree nut and peanut free. As a baby my son could not ingest dairy even in minute quantities without his whole body swelling up literally like a cue balloon. However, today at age 11 he can have processed dairy like cheese or chocolate – yes, there is hope. But, I was surprised how incredibly difficult it is to find chocolates that have been processed in a facility that do not process nuts. Initially I would take a chance and unless the packaging said ‘May contain traces of allergen’, I would give him the chocolate. That was until I visited the Hershey chocolate factory in Hershey, PA. Since then, I have realized that we have just been lucky thus far since cross-contamination is very likely if the equipment is shared. So, if one can eat products like chocolate with dairy in it – this chocolate is the best I have found in the market. The packaging is beautiful and the chocolate itself is shaped soooo gourmet – love! 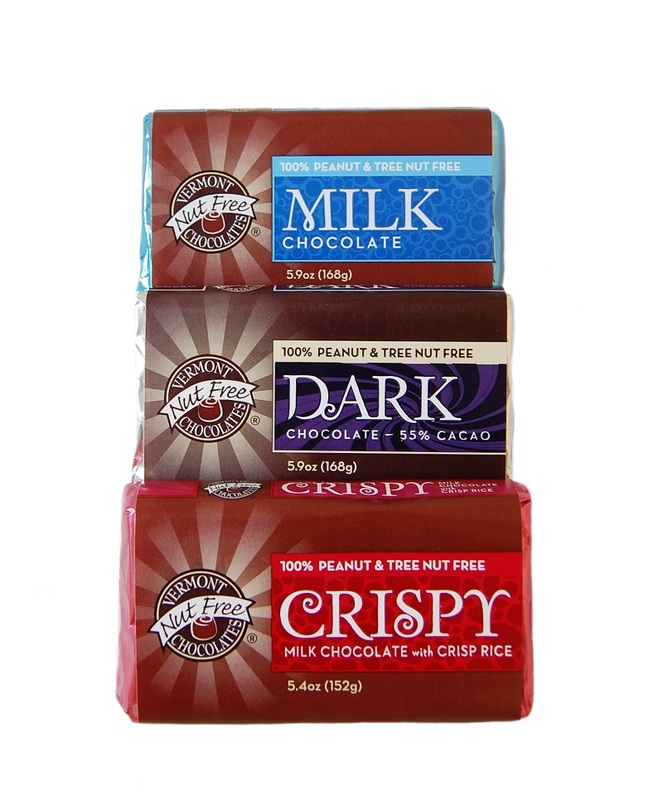 Picture courtesy: store.vermontnutfree.com Our personal favorite the decadent dark chocolate! First off, I have to gush over the adorably cute packaging of this range of legume pastas – it instantly communicates the image of fun, youthful and organic through the use of earthy tones on a brown paper base. I am a vegetarian and the nutritionist in me firmly believes in legumes as a fabulous source of fiber, proteins and healthy carbs. And then I found his useful nugget of gold on the Why Legumes page of the Tolerant Foods website, ‘Plant protein found in legumes provide the body steady, lasting energy that can last 4-6 hours vs. meat which only lasts about 2-3 hours!’ In my experience, the incidence of soybean and chickpea/ garbanzo beans allergy is quite high. However, lentils and beans like black bean, red lentil, mung bean, peas is relatively rare. My son is allergic to soybeans and chickpeas so lentils and beans are the way he gets his vegetarian proteins. Apart from the zillion lentil/ bean soup recipes that Indian cuisine abounds in, I love the legume pasta version – packs in the vegetarian protein punch despite food allergies. Posted on 6 Mar 2017 7 Mar 2017 by Anu RaoPosted in Product ReviewTagged allergy-friendly pasta, Enjoy Life, Nut-free chocolate.